Disclosure: I received a sample product to help facilitate the review. No other form of compensation took place. All opinions stated are genuine and my own. One of the great things I love about blogs, and this was true even before I started one of my own, is that you find the cutest products on them! 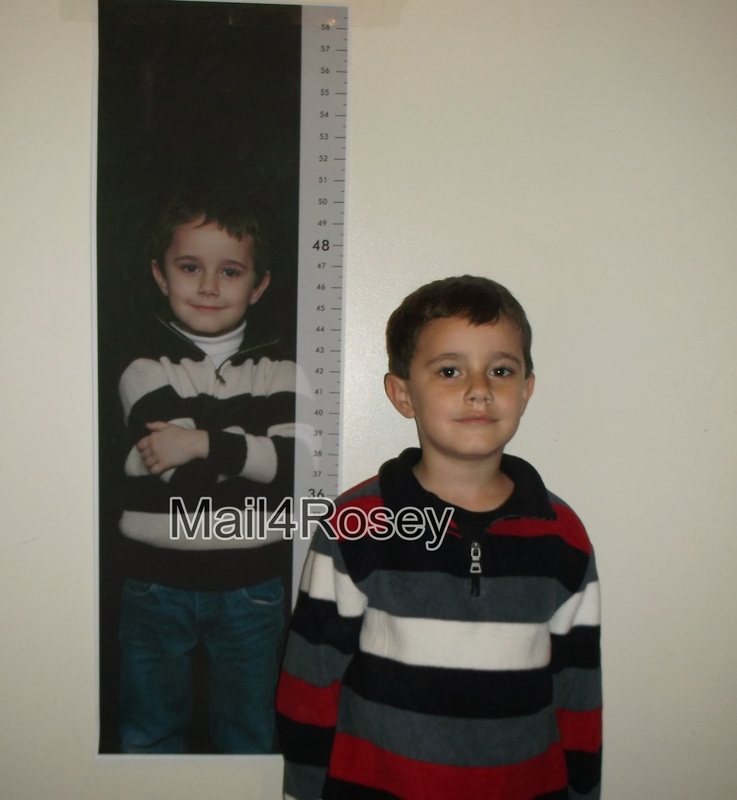 Today it's my turn, and I have a cute product to show you: The Personalized Growth Chart shown above, from MailPix. Hurrah! You can pretty much turn these into anything you'd like. You can use one picture like I did for mine (like in the picture above), use multiple photos (like in the picture at the top of the post), add text, choose a design, have no design...it's really up to you, and the sky is the limit. Promo Code: PhotoGrow (ends 10/31). To learn more about MailPix, you can visit their website. I so wish I would have started growth charts when my kids were itty bitty. They grow so fast! I really need to start a growth chart with Sofia. My sister and I each had one growing up and it's such a great thing to look back on for the parents AND the kids as they grow! When I was little my parents had a spot on the kitchen wall marking our growth in pencil. It is still there! and It is so special! Sadly, I've never charted my childrends growth. This is such a special way to do so!! Thats very cute! I wish I would have kept my son's measurements from his doc appointments so I would know how tall he was at each age. Lovely idea! love it! so many different cute things you can do!! This sounds like a great product! 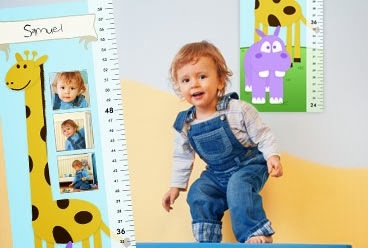 I use picmonkey sometimes to play around with pictures but I think the personalized growth chart can actually record the growth of your baby in a fun way.. Thanks so much! The giveaway is for just US? This giveaway is US only. Thank you for visiting! How cute this would be for my Grandson to have to chart his growth. I like that you can move it and not have to keep it in one spot. aww these are so cute, I am definitely entering. I would love to have one of these grow charts for my grandchildren. It would be a very special thing to have at my house to keep track of their growth through the years. I am not sure these growth charts would work with my kids because they are older, but I have some friends who could use these for sure. I wish my kids were still little. I would have so much fun with one of these! Cute giveaway! This is one thing I never did with my kids when they were little, I wish I had. This would be perfect for my niece, thanks for the giveaway! Those growth charts are cute! That's so cute. I'll pass that along to those who have babies! This is such a great idea. It sure looks easy if you move! Such a cute idea for a growth chart! My kids would love to have a chart just for them! I really like this. I'm bookmarking this for my little one. I like the photo part to this too a lot but mainly the measurements! I love personalized growth charts. I actually have one but it doesn't have Madison's pic on it. This one is really nice. I love the fact that years later you can look back on that pic and remember how small they were. I love the availability of the photo puzzles. The photo puzzle is cute! It's so fun that he's on the growth chart. He's a very cute child! This is such a great idea and a wonderful keepsake. I like the photo panels. I also like their photo books. I really like their fleece blankets. Thanks for the great giveaway opportunity. Keep up the terrific blogging. I like the canvas print. Thats the awesomest idea ever!! It's a great company for personalised gifts. I love the wall Courture! i love the photo blankets. I really like the fact that you can use your personal photos to embellish so many things--as well as just get them as extra prints for family! I liked a lot of their products. May need to try their photo books. Great idea for parents. Kids grow up SO FAST, and those precious moments can be lost!